Located in southwest LA in the Westchester neighbourhood, approximately 16 miles (26km) from Downtown Los Angeles, the Los Angeles International Airport is situated on the Pacific Coast and is the world's sixth busiest airport. 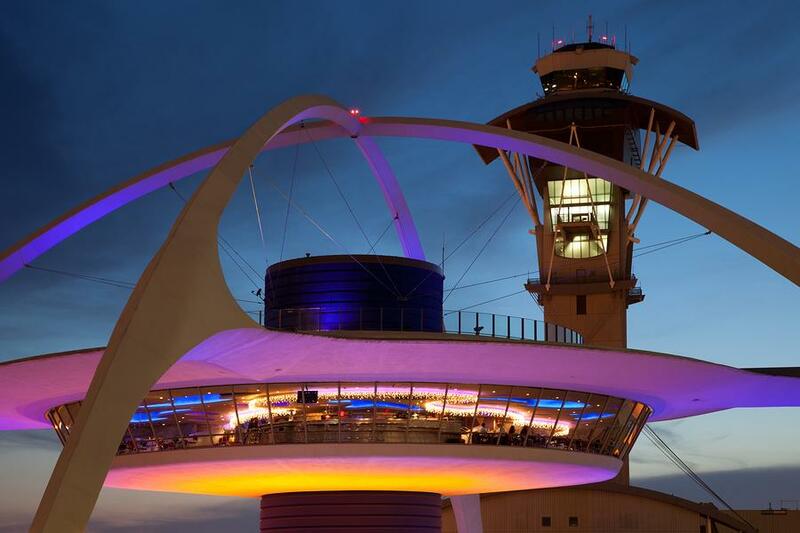 More commonly known simply by its airport code LAX, the Los Angeles International Airport is the USA's third busiest airport and in 2011 took out the title for the world's busiest origin and destination airport, meaning it had the most passengers who remained in the city. The central airport complex is home to 9 passenger terminals which connect via a horseshoe shaped split level roadway. The airport services 69 international and 87 domestic destinations in North America, Latin America, Europe, Asia, Oceania and the Middle East. The major airlines servicing the airport include United Airlines, American Airlines and Southwest Airlines as well as Delta Air Lines and Alaska Airlines. All terminals are serviced by a shuttle bus with terminals 5, 6, 7 and 8 connected via walkways. To access all other terminals, you'll be required to catch the shuttle. Most inter-terminal connections require passengers to pass through security before continuing on to their required terminal. Baggage check-in is situated curbside on the upper departure level while baggage claim can be found on the lower level. There are also a wide range of shopping and dining options including cocktail lounges, restaurants, newsstands, gift shops and duty free shopping. LAX is also home to the Tom Bradley International Terminal, located at the west of the passenger terminals. Serviced by 27 airlines, the Tom Bradley Terminal features 12 gates with six on the north concourse and six on the south. This terminal services most of the major international airlines and handles approximately 10 million passengers per annum. Another distinctive feature of the Los Angeles International Airport its white googie 'theme building' resembling a flying saucer on legs. Designed and constructed in 1961, it was designated a Los Angeles Historic-Cultural Monument in 1992. Undergoing renovations in 1997, the building features retro-futuristic interiors and lighting designed by Walt Disney Imagineering.